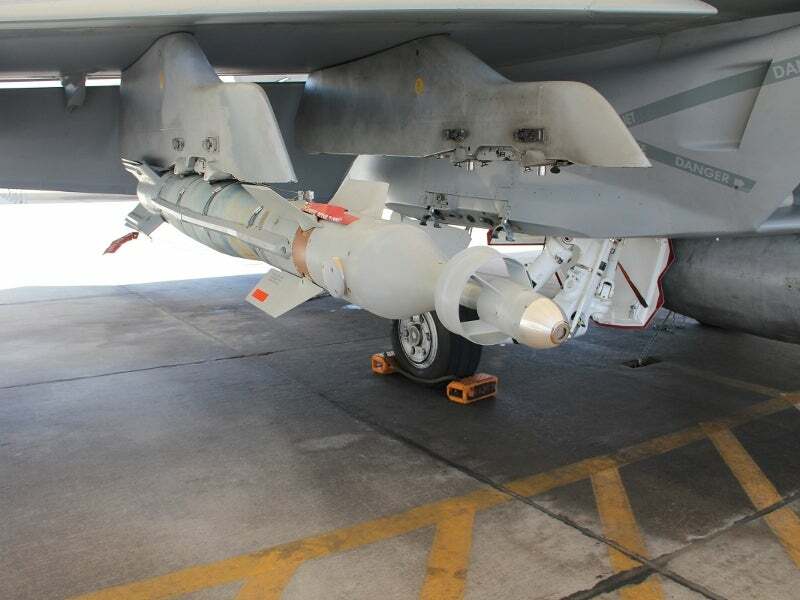 A Paragon direct attack munition integrated on an F/A-18 Super Hornet fighter aircraft. Image courtesy of Lockheed Martin. The Paragon weapon can be equipped with a 500lb MK-82 warhead to hit fixed or moving targets. Image courtesy of David Starner. Lockheed Martin’s laser-guided bombs (LGBs) served as the basis for the Paragon direct attack munition. Image courtesy of U.S. Navy, photo by Photographers Mate 3rd Class Joshua Karsten. Paragon all-weather, dual-mode direct attack munition (previously named Dual Mode Plus laser-guided bomb (LGB)) is designed and developed by Lockheed Martin to provide warfighters of the US and its allied nations with the capability to engage potential targets in a tactical environment. The air-launched weapon features precision strike capability and can destroy stationary, relocatable and moving targets in close air-support and urban warfare missions, while reducing collateral damage effects. It is compatible with a variety of aircraft and operated by the US and foreign military forces, such as the AV-8B Harrier II single-engine ground-attack aircraft, F-35 Lightning II single-engine multi-role fighter, F-16 Fighting Falconsingle-engine fighter, F-15 Eagle twin-engine fighter, F/A-18 Hornet twin-engine fighter, and A-10 Thunderbolt II attack aircraft. The weapon can be carried on the aircraft’s weapon pylons, which are capable of MIL-STD-1760/1553 or Universal Armament Interfaces. Lockheed Martin conducted two test flights of the Paragon direct attack munition, equipped with Mk-82 inert warheads, from an F/A-18 Super Hornet fighter jet at the US Navy’s Naval Air Weapons Station (NAWS) China Lake in California, US, in May 2016. The Paragon successfully engaged fixed targets within operational requirements, during the test flights. Additional flight testing of the Paragon from F/A-18 Super Hornet is underway. Test flights of the weapon from F-16 fighter aircraft are scheduled to take place in the second quarter of this year. The Paragon direct attack munition is designed based on the Paveway II Plus laser-guided bomb system. It incorporates computer control module and guidance kits at the forward portion, and warhead in the middle section. Its rear portion houses airfoil components in a standard LGB air foil group (AFG). Four pneumatically controlled canards are located in the bomb’s forward section and four foldable wings arranged in X-shape wing pattern are located at the rear control section to provide high manoeuvrability. Four control surfaces are installed at the trailing edge of the airfoil group to provide lift and aerodynamic control for the weapon during the flight. The Paragon is compatible with Common Munitions Bit / Reprogramming Equipment (CMBRE) test set with ADU-892A/E. The front-mounted weapons guidance unit (WGU) comprises a semi-active laser seeker, inertial navigation system (INS) and dual-antenna global positioning system (GPS), and allows the weapon to operate in three modes, namely GPS / INS, laser and dual mode. "The air-launched weapon features precision strike capability and can destroy stationary, relocatable and moving targets in close air-support and urban warfare missions, while reducing collateral damage effects." In GPS / INS mode of operation, the GPS-aided INS, along with inertial measurement unit (IMU), provides accurate navigation, position, velocity, altitude and target acquisition data, both prior to launch and during the midcourse phase of flight. In laser mode, the onboard semi-active laser seeker enables the weapon to pinpoint fixed or fast-moving targets with high-precision when GPS is denied. It guides the weapon towards the target during the terminal phase of flight. It also provides the bomb with the ability to engage relocatable in man-in-the-loop targeting mode. The weapon offers an impact accuracy of approximately 4m in laser or dual mode of operation. The Paragon bomb can be equipped with the US-made, MK-80 series, low-drag, general-purpose aircraft warheads to attack enemy aircraft shelters, reinforced concrete structures, armoured vehicles, and bunkers. The warhead options include 500lb MK-82, 1,000lb MK-83, 2,000lb MK-84, and 2,000lb BLU-109 hardened penetration bomb. The warheads can be fitted with a variety of nose and tail fusing options such as M904 and M905 to initiate and detonate the main charge. The weapon uses a proximity sensor to produce air bursts against ground targets. The Paragon direct attack munition provides greater operational effectiveness against high-priority static and moving targets at stand-off ranges. It also delivers improved cross-range accuracy in all environmental conditions.